STARLED 3 EVO PLUS is the lamp for diagnosis and surgical use which thanks to an innovative illumination system based on LED technology (Light Emitting Diodes) offers exceptional performance advantages with state of the art technology. STARLED 3 EVO PLUS, completely digital, is controlled by microprocessors and has a new I-sense control panel which grants an extremely simple and ergonomic way of regulating and visualizing light intensity, ENDO function (light up) as well as the selection of the three lights that form it. 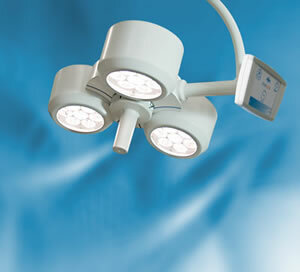 Based on the needs, it can be used with one, two or three of its lights. Thanks to the manual controls in the central handle, STARLED 3 EVO PLUS has the possibility of focusing the light beams with a simple clockwise or anti-clockwise rotation of the handle. This has a simple system to insert and remove it, granting fast remotion and sterilization. In STARLED 3 EVO PLUS the ENDO function (light up) grants an ambient light thanks to light beams coming from the upper part of the lamp, this consents the regulation of light levels particularly fit for the preparation, assistance and monitor of the patient during the intervention and microscope surgery.